There’s been quite a bit of renewed activity on the various boulders at Clogwyn y Bustach in Nant Gwynant. 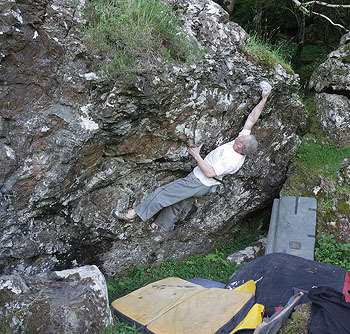 Hardest problem so far is Bara Brith 7C+ which tackles the obvious line crossing the roof of the White Panther boulder. This can be found by walking towards the hydro electric power station from the normal Fagin area. After a tip off from Si Panton, Danny Cattell swooped in and managed to climb it within 15 minutes; he is climbing very well at the moment so it may turn out to be harder. “It climbs really well and the actual holds you use are located on the nice rock (except for the starting flake) and they’re perfect skin friendly little crimps.” Said Danny after the ascent. His brother Sam caught the action on his mobile phone; see the film at the bottom of the report. The left to right lip traverse which gives the boulder its name was first climbed by George Smith (yes, Big G!) – this goes at a pumpy 6B+/C. Martin Crook also climbed Low Key Cats a 6B sds line coming out from the bottom left side of the roof cave. 50m farther to the right (and closer again to the power station) is the Power Block which has a steep face on its right side. Here Martin climbed Beauty Steep 6B+/C which starts sitting on the boulder on the left; pull on with your left hand low and your right on an obvious hold. Cross through to the obvious slot and power up to lip pockets before pulling over and finishing up into the scoop. Gav Foster then added Beauty Steep direct start a fierce, fingery 7A+ sds coming up from below and left of the slot (start with your right on the obvious thin sidepull). And lastly Si Panton climbed Beauty Steep Right Hand 7A – this starts sitting on a double pad (a one pad start doesn’t seem to work very well, and neither does a crouch), left hand sidepull/undercut, right hand on obvious undercut. A few zig-zagging snatches lead into the normal finish. This boulder does seep after sustained rain, but is fully dry at the moment. It is possible to walk into this area from the power station which can be reached by driving along from the campsite road.